Now the afternoon was for the Grey-necked Picathartes or Grey-necked Rockfowl (Picathartes oreas). We expected an arduous trip of hiking for hours through tropical heat in the National Park. Some people say, that the bird only appears after rain storms. If this would be true, we would be unlucky, as on our first day in the park’s interior, it did not rain. We had only one more day in the park – but rain seemed likely enough for the next days. I cannot confirm, that the particiapants of the trip showed sights of anxiety and gloom. But never you know. On trips prior to ours the bird had not been seen. But already with the hike we were lucky. We had a short, pleasant and fairly easy hike with lots of good birds to at “cave” formed of several enormous boulders where the birds build mud nests on the sides of the rocks during the breeding season. We hoped that no rain was needed as our guides told us, that this species checks on its breeding site every afternoon or during dusk. We arrived early in the hope that the birds would appear in some natural light. Maybe earlier than normally to expect. One of the local guides tried to show as the nest a bit too much. We almost shouted through the forest to keep him from removing the nest. The have never been seen away from these nesting sites. We walked around the boulders, found a “entrance” and looked for an arrangement of smaller rocks to be sit on. Then we sat motionless and perfectly still in a half-round for nearly 45 minutes awaiting the birds, which finally showed up and hopped about as though we weren’t even there. The Grey-necked Picathartes showed right by my leg — but hopped off before anyone had more than a brief look. We waited; sure it would return but in another place – maybe more in the open. But no, it was another 20 minutes before a bird appeared on a almost the same spot. It stayed longer, hopped to a branch in the middle of the cave and could be photographed this time by all participants. This time the bird hopped into the cave and bounced about for a while, ignoring us, inspecting its nest site, and making an occasional hiss, one of their two vocalizations. All too soon, they were gone. We took deep breaths, closed our eyes, and burned the experience into our memories. We were the happiest people on the world. Wow, what a Mega!! Our route gave us already excellent chances at all 26 regional endemics of Cameroon. This included legendary birds like Bannerman’s Turaco (Tauraco bannermani), Arabian Bustard (Ardeotis arabs), Egyptian Plover or Crocodile-bird (Pluvianus aegyptius), Mount Kupe Bushshrike or Serle’s Bushshrike (Telophorus kupeensis), Banded Wattle-eye (Platysteira laticincta), Shelley’s Oliveback or Fernando Po Oliveback (Nesocharis shelleyi) and Cameroon Speirops (Speirops melanocephalus). However, when one thinks of Cameroon, one bird lurks high on the list above all others, and that is an odd, enigmatic, and pre-historic passerine in the genus Picathartes. 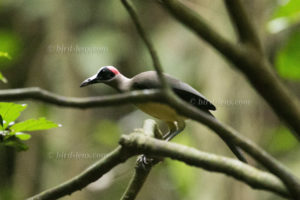 Hopping about on strong legs amid closed-canopy rainforests, where rocky outcroppings called “inselbergs” sprout from the flat forest floor, the Grey-necked Rockfowl is a big target bird for world listers and those seeking representatives from each of the 230+ bird families. The Birdlife of West Africa was on the schedule for April 2017. I decided for the Africa specialist Rockjumper. Cameroon is a vast and diverse land; lying just north of the equator. This bird-rich nation forms the inter-grade between West and Central Africa and harbors a wide range of habitats, ranging from steamy lowland rainforest to Sahelian semi-desert. By combining the Rainforest & Rockfowl tour with the Northern Extension tour of the Africa-specialist Rockjumper I was confident to book a birding tour that visits all of the area’s core ecological zones and provides a thorough coverage of this West Africa birding destination in three-weeks. And I was not disappointed! To cope with the growing demand for top shots of the rarer species of the Palearctic Bird-Lens is keen to enrich the range of pictures of birds you can find in the western Palearctic or elsewhere. Beside the image above you can find a nice selection of birds in the gallery or in the “Pictures Shop” very soon. Just give a message, if Bird-Lens could serve you with an image needed before the new pictures are online.